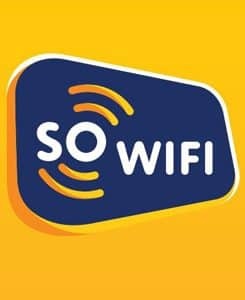 Easily attract new customers by offering free Wi-Fi. 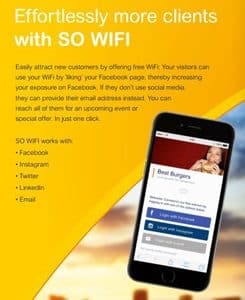 Your visitors access your Wi-Fi by liking your Facebook page, increasing your exposure on Facebook. If they don’t use social media, they can log in with their email address instead. You can reach all of your clients for an upcoming events or special offers in just one click! There are 1.01 biliion daily active users on social media. The average Facebook user has 388 friends. Twitter has 307 million monthly users. LinkedIn has 396 million members. ​No matter where you go, people are using their mobile devices. When a customer logs on to your Wi-Fi, their information is captured their information and advertises your business on social media. ​1. Customers select your Wi-Fi. Customers connect by selecting their social media preference ie: Facebook, Instagram, LinkedIn or Twitter. Your business is now advertised on your customer’s social media. Very powerful when the average Facebook user has 388 friends! customers Target market by age, gender, language and more. Send offers and vouchers. Customers can also be asked to rate you on TripAdvisor, helping to lift your TripAdvisor rating to encourage new customers. 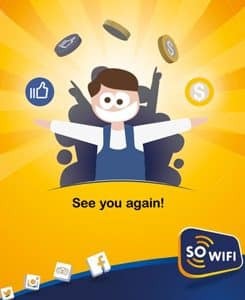 Turn the cost of your free Wi-Fi into profit. The platform captures your customer’s data and you use this on the automated platform to engage with your customers. Send offers, invite them to special occasions, the list goes on. Every time your customers use your Wi-Fi, they enter through selecting their preferred platform. Instagram, LinkedIn, Facebook or Twitter. Automatically your business is advertised on this platform. This reaches hundreds of customers. Send messages to your customers. 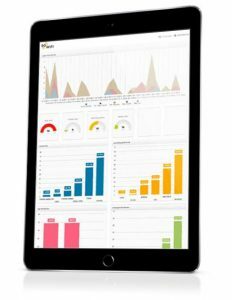 Once a customer had logged on to your Wi-Fi, you have all their credentials displayed on a real-time dashboard. Name, DOB, email, gender, the area they live & their interests. Send vouchers, create events & offers. Automated birthday message offers. Set and forget. Tight security provides you with complete control of who uses your network and for how long. In real-time, you can see who is using the platform, block users or limit their time. It’s all up to you. Perfect overview. 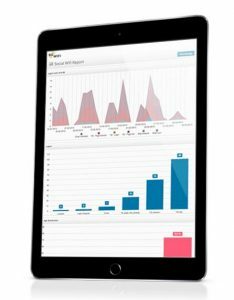 Create custom reports and gather detailed information about your visitors. Send push notifications to customers. Set and forget automated messages. Export data & send emails. 83% of travellers consult reviews before making a booking. When customers leave your Wi-Fi area, TripAdvisor will automatically invite your client to review you on TripAdvisor, helping to lift your TripAdvisor rating and generate new customers in the future. Use this to your advantage! 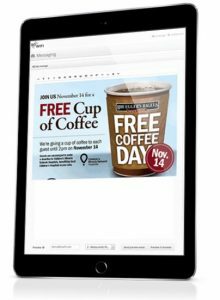 ​You will be provided with free advertising collateral to advertise your Wi-Fi; encouraging users to log on (table cards & posters). The more customers that log on to your network, the more powerful the product becomes.